1. Subtitles are gone after converting MKV video to .mp4 for my iPhone. 2. Experience no audio track problem after the MKV to iPhone conversion. 3. MKV encoding ruins the image quality and leads to a terrible loss of quality. 4. The converted MKV files eat a huge amount of my iPhone space. Is there any tool with efficient encoding method? 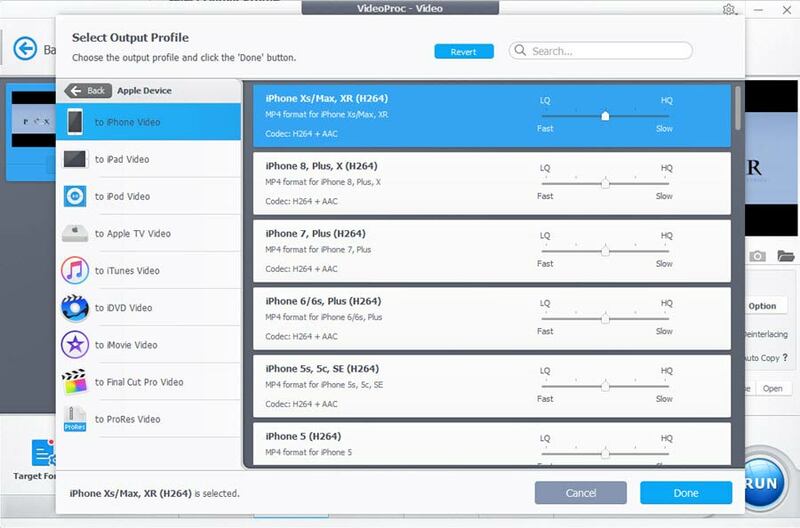 If you are frustrated by the faulty and disappointing video conversion, check the post below and learn how to efficiently convert MKV to iPhone with VideoProc. - Convert MKV to MP4, MOV, M4V, etc with audio tracks and subtitles kept. - Auto copy MKV to any format without re-encoding, retaining 1:1 quality. - Batch process MKV files and others fast and efficiently. Support 370+ codecs. - Optimize conversion presets for iPhone (XS/XS Max), iPad, Android, Apple TV, etc. - Edit MKV with advanced features like cut, trim, crop, split, merge, add subtitles, etc. For a successful MKV to iPhone conversion, you can give VideoProc a whirl. By courtesy of 370+ audio/video codecs, VideoProc has the knack for converting virtually any video files (MKV, HEVC, WebM, MTS, WMV, AVI, AVCHD, etc) to iPhone supported formats such as MP4 and MOV. 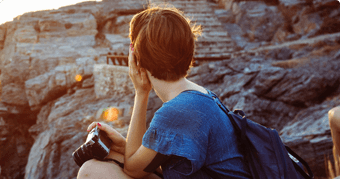 By taking advantages of the advanced VBR encoding method, VideoProc converts any videos with much better quality-to-space ratio for the same file size. On top of that, the tool features unique level-3 hardware acceleration tech, which means you will never experience lengthy video transcoding or computer freezing, even when you are coping with the large-sized 4K MKV file, but only finish the task at a really fast pace. Check the guide below and learn how to convert MKV to iPhone supported formats based on your needs. But prior to the converting steps, make sure to download VideoProc on your Mac or Windows. Step 1: Load the Source MKV video. After you launch VideoProc, Click Video on the main interface to activate the video processing window, where you can tap +Video to load the source MKV file. You can load more than one MKV file at a time or press +Video Folder for batch processing MKV videos. VideoProc is preconfigured with 420+ readymade profiles for different purposes. Just choose the delivery format from the bottom of the main interface. Here we suggest choosing MP4 H.264 or MOV for the best compatibility with iPhone. Note: For beginners, VideoProc makes the transcoding from MKV to iPhone a snap without the need to know the obscure video settings and get MKV converted to iPhone. Just click Target Format on the lower left corner > go to Apple Device > to iPhone Video > select the specific iPhone model you are working with and click Done. It is still able to convert MKV to iPad, Apple TV, iTunes, iMovie, Android and more with one single click. Step 3: Start Converting MKV to iPhone MP4/MOV. 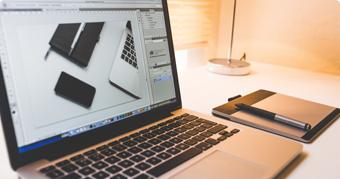 Click Browse to specify the output folder where you want to save the converted MKV video, and press RUN button to begin the conversion from MKV to iPhone. The same also applies to convert MOV to iPhone if MOV video won't open/play on iPhone. * To Convert MKV to iPhone with Subtitles/Audio Tracks: If your MKV file contain multiple subtitles and audio tracks which you want to keep, just select the subtitles and audio tracks at the top corner of the video information as per your needs. Then you can play MKV video on iPhone with wanted languages and audio tracks. Step 1: Choose MP4 or MOV as the output format since it is listed as the best video format supported by iPhone. Step 2: Check the Auto Copy box at the lower right corner of the interface. This guarantees that the MKV file is remux into another file format without re-encoding. Thus nothing but the container format is changed and the audio and video quality is kept intact. Make sure the video codec is the same as original, or your MKV file will be encoded with some loss of quality. Step 3: Click RUN to begin copying MKV files to MP4 or MOV for iPhone. Step 1: Go to Video at the bottom of the main interface. Step 2: Choose MP4 or MOV as the output format. Step 3: Click cog-wheel Settings to enable the parameter window, where you can adjust the parameters. 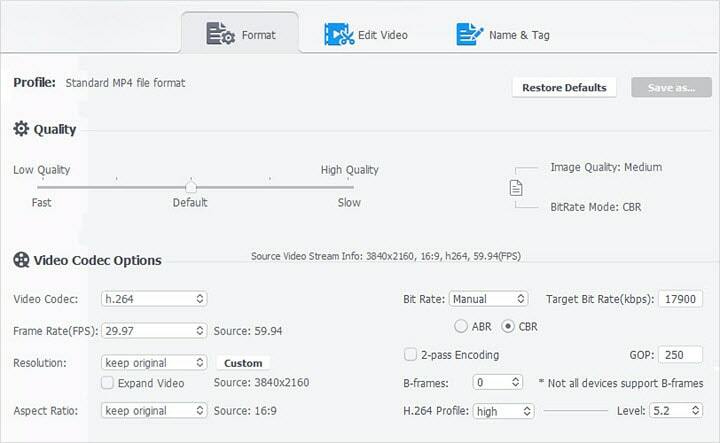 • Codec: Set the video codec as H.264. If you are using iPhone 7 or newer model, you can change the codec to HEVC that features smaller size and better quality. • Frame Rate: Keep the frame rate unchanged. Generally, 30fps is the threshold for smooth iPhone video playback. • Resolution: Lower the video resolution, e.g. from 4K to 1080p. Although the latest iPhone is capable of 4K video recording, its display screen still reaches no more than 2K. Keep the video resolution extremely high doesn't make any visual enhancement but occupies much space instead. So it's suggested to downscale your video if its resolution is high up to 2160p. • Aspect Ratio: Change the aspect ratio to 16:9 for full screen playback. • VBR Code: VideoProc features accurate VBR coding to lower the file size at the same quality level. You can even manually adjust the bitrate in accordance with the resolution. Generally change the bitrate to 3500kbps for a 1280x720p video. • Adjust GOP: Generally 250 is the threshold value. 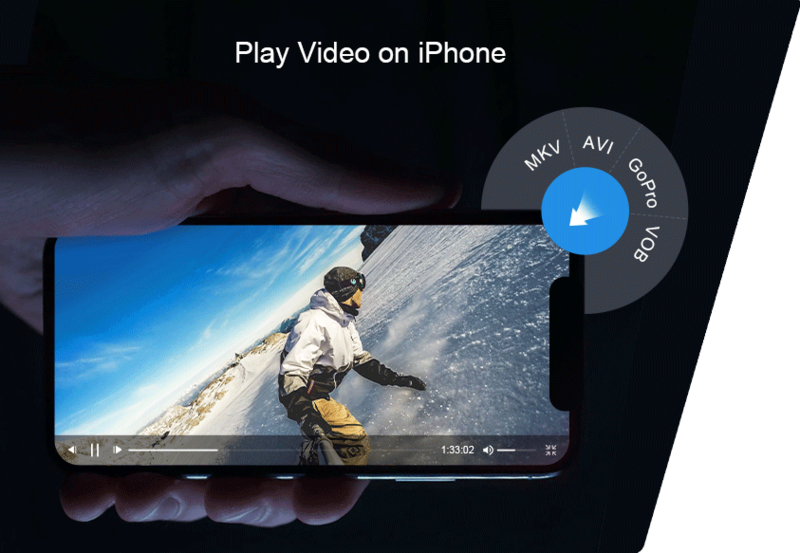 With full GPU acceleration, high-quality engine and advanced video compression technology, VideoProc makes the conversion from MKV to iPhone fast and easy, without compromising on quality. You can even cut, trim, crop, split the MKV file to smaller size and get it transferred to iPhone for less space occupation. What is MKV [Wiki]: MKV is an open source video container format capable of holding an unlimited number of video, audio, picture and subtitles tracks all in a single file. It is generally used for storing Movies, TV shows. Eric Pascal previously held a senior editor role at Digiarty, covering almost any technology to do with Apple, from reviews, complex troubleshooting tips, to software related. Eric's quite adept with photographing & post production subjects. 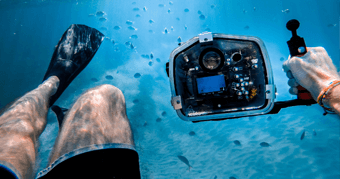 His journey into the world began somewhere in 2012, aiming to help photographer get out of sticky situations. He's also a keen musician and sportsman.